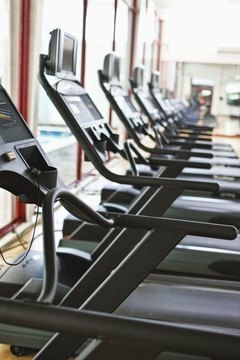 HIIT training on the treadmill torches more calories than steady-state cardio. 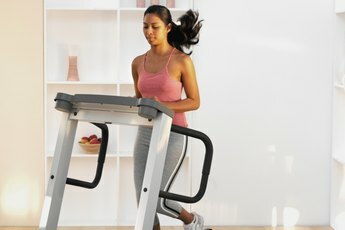 High intensity interval training is a calorie-torching exercise technique that combines two of the most powerful fat-burning methods for quick results in a short amount of time. One hour of steady treadmill walking for the average 140-pound woman can burn 277 calories, while one hour of HIIT training can burn 445 calories or more. One of the main reasons that HIIT training is so effective is because it provides your body with an after-burn effect that steady-state cardio does not. This is also known as excess post-exercise oxygen consumption, and it significantly increases your metabolism to burn more calories for up to 24 hours after you've completed your workout. EPOC is almost nonexistent for traditional cardio, so jogging at the same speed on the treadmill for hours might not be the most efficient way to use your gym time. During high-intensity interval training, the level of oxygen that your body can actively use during your workout skyrockets. This means that although you’re spending a much shorter amount of time actually exercising, your overall aerobic capacity is increased in the long run, providing you with more stamina for a longer workout duration in the future. HIIT training also taxes both the anaerobic and aerobic thresholds for greater results, while steady-state cardio impacts the aerobic threshold only. The more consistently you perform the same exercise regimen, the less your body will respond to what you're doing. It takes change to create change, especially when you're looking for fat-loss results. Increased workout variety is also linked to decreased mortality rates. HIIT workouts are great for giving your body a little shock, and you can use many different run-to-ratio patterns on the treadmill. High-intensity interval training also creates a higher level of compliance compared to regular steady-state cardio. Individuals with busy lives are more likely to squeeze a quick 20-minute HIIT workout into their day than a full 90-minute session at the gym. For a smaller time investment, you can receive the same -- if not better -- results by incorporating HIIT training into your regimen. Sharecare: Why is Variety Important for Fitness Routines?